Witches, ghosts, and Vampire Facials! Last Monday, I headed to my favorite aesthetic office in Carmel for the microneedling with PRP treatment, commonly referred to as the Vampire Facial. Microneedling is pretty much what it sounds like. Tiny needles prod your skin to resurface and smooth the texture. PRP (platelet rich plasma) is produced from your own blood and contains highly concentrated amounts of natural growth factors that promote the regeneration process of soft tissue. PRP combined with microneedling helps to stimulate the natural healing process and produce collagen. I won’t even lie, I was nervous to have my first Vampire Facial. Mostly about getting my blood drawn because no one actually enjoys that, but I was also anxious about what it might feel like to have my face poked with a bunch of tiny needles. 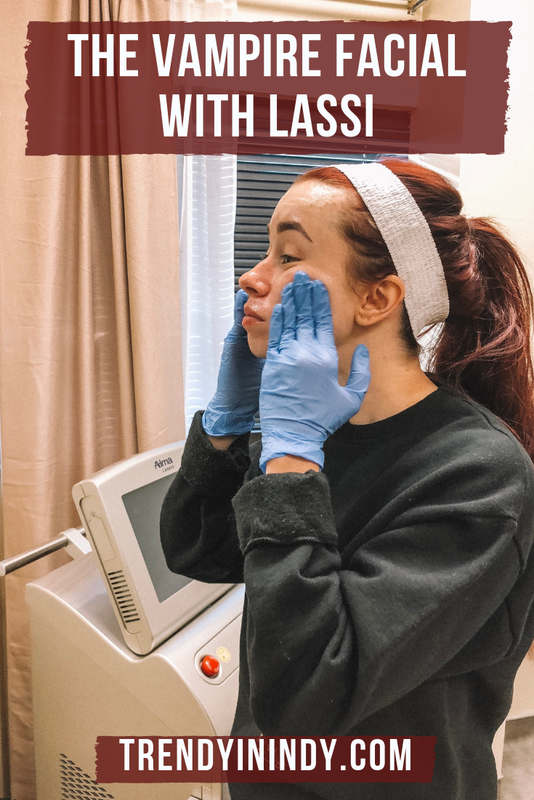 When I arrived at LASSI SKIN on Monday at 9:15 for my Vampire Facial, I started the 45 minute numbing process right away. Maura gave me a topical numbing cream to consistently rub all over my face, careful not to get it in my eyes. After maybe 20 minutes, my blood was drawn so that it could be spun in a centrifuge. After another 30 minutes, Maura came to grab me because the PRP was ready and it was time to start. She asked if I had any questions and all I could think about was that the machine sounded like I was about to get a tattoo across my forehead. As usual, Maura was thorough in explaining the procedure and telling me what she was doing. And guys, I could barely feel a thing! It was quick and painless with just a little pressure. Now, there are various levels of intensity with this Vampire facial as with most treatments. Because I had an event just three days later, Maura only used .5 mm needles, but she could have done up to 3 mm. The more aggressive, the more redness patients experience, but also you might notice more visible results. How often should you get The Vampire Facial? The procedure I had done can be done twice a year or more depending on what results you are trying to achieve. What’s the maintenance like once you start facials? Facials are recommended every 4 weeks to get that deep cleanse that isn’t possible to achieve at home. That being said, a solid skincare routine is crucial in fostering lasting results you see initially from facials. Check out my skincare routine here. What is the price on services at LASSI SKIN? Prices range from $140-600. It just depends on the procedure. If you follow them on social media, you can earn 30% off your first facial and they are offering $100 off Microneedling until October 31. At the beginning of every month, you can also get Dermaplane free with any service. Does Dermaplane help with acne? Dermaplane is actually not recommended during an outbreak. This is an intense exfoliation process that removes the dead skin cells using a special blade. What skin types can have The Vampire Facial? Any skin type can get The Vampire Facial and will benefit from it. However, this facial is known to help with acne scarring and sun damaged skin. If you have those problem areas, this procedure might be recommended more than twice a year. I noticed that my skin was instantly smoother after my Vampire facial. The mole on my face appeared smaller and over the last few days, my makeup has never looked better. I haven’t struggled with severe acne and I take really good care of my skin so this procedure worked well as a resurface for my face. If you’re interested in learning more about Vampire facials, I’d highly recommend reaching out to LASSI SKIN because they are the experts. I’m happy to share more details about my experience, but you can also see it on my INDY Story Highlights on Instagram. *This post was sponsored by LASSI SKIN. All thoughts and opinions are my own.